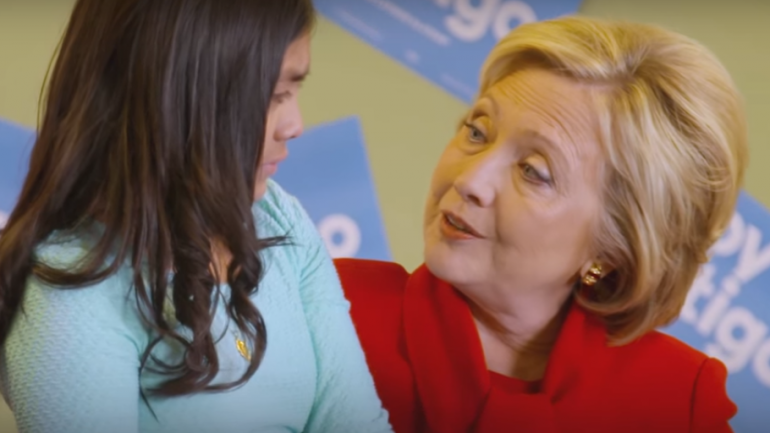 With the Nevada Democratic caucuses around the corner, Hillary Clinton has released a heart-wrenching ad in which she comforts a 10-year-old girl who fears that her parents will be deported. The ad is not scripted, and was shot in a natural, documentary style at a recent campaign event in Nevada. It’s lightly edited, giving it an authentic feel. The girl, identified by MSNBC as Karla Ortiz, tells Clinton that her parents have already received a notice of deportation. “I’m scared they’re going to be deported,” she says. Ortiz is tearing up. Clinton beckons her over. She leaves the arms of two adults. Clinton delivers a poignant pep talk. “You’re being very, very brave, and you have to be brave for them, too,” she says. “Let me do the worrying. Then as the camera cuts away, two other people on the left are crying (it’s unclear if they are audience members or campaign staff). That editing choice invites the viewers to cry as well. Of course, the magic and the authenticity disappear at the end. “I’m Hillary Clinton, and I approve this message,” she says, reminding us that this is just a sliver of the campaign that she wanted us to see. In a followup interview with MSNBC, Ortiz confides that she has a Guadalupe statue that she cries to every night after praying for her family. As for Clinton’s Democratic rival, Bernie Sanders, Ortiz says she’s never heard of him, but that she will research him.